Emmaus is a two campus Catholic Co-educational Regional College which opened in February, 1980through the amalgamation of St Thomas More College (1968-1979) and Chavoin College (1966-1979). It was established to provide co-educational choice for families in the Whitehorse, Monash, Knox, and Boroondara areas. With the school now in its fourth decade, it has forged its own heritage, while also benefiting from the rich traditions of the two Colleges. Many Emmaus students are the sons and daughters of past students. programs during the last decade have seen five state-of-the-art contemporary learning facilities created as well as significant renovations to other buildings. We are very proud that our students have such a wonderful learning environment. The Emmaus College crest has been very much a part of the history of the College from 1980. 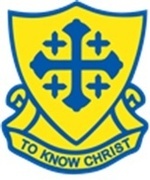 The crest features the words, ‘To Know Christ’ which draws inspiration form the Emmaus Story in Luke’s Gospel (Luke 24: 13-35). The cross depicted on the crest is the Jerusalem Cross which dates back to the time of the crusaders. The Jerusalem cross represents Christ’s command to spread the Gospel around the world.